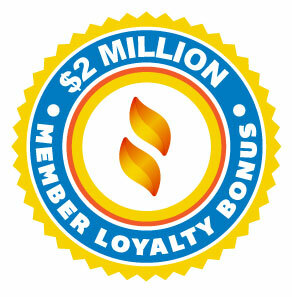 We are excited to announce that we distributed $2 million into the accounts of our qualifying loyal member-owners. Check your primary savings account to see if your membership qualified to earn a portion of the $2 million. If you have more than one membership with the credit union, you may have received multiple deposits, so be sure to check all of your accounts. What is the Loyalty Bonus? Basically, it’s profit sharing. The Loyalty Bonus is our way of saying thank you for helping us grow and sharing in the success of the credit union. Gulf Coast Educators is a not for profit cooperative made up of educators helping educators. Here, your money isn’t being used to pay thousands of shareholders, or to pay big bonuses to a board of directors (ours are all volunteer). We invest your money back into you, which is why your loyalty matters. When you do small things, like using your debit card or having direct deposit set up, you are helping your credit union grow. As we grow, we are able to provide more innovative technology, open more branches, and ultimately, serve you better. And when we do really well, we are able to pay out a loyalty bonus. To date, the credit union has paid out over $9.9 million to our loyal member-owners in the form of loyalty bonuses since 2014. This year, 24,796 of our members received a loyalty bonus. If you’re happy with your credit union and you know it, tell a friend. As a loyal member-owner of the credit union you can help by taking advantage of all the credit union has to offer (refer to your owner’s manual) and encouraging others who qualify to become member-owners of the credit union to get involved. All we ask is that you share the good news with your family, friends and coworkers who are eligible to become member-owners of the credit union so that we can continue the success of our financial cooperative. Share how happy you are about being a member-owner of your credit union and how rewarding it can be. * Debit Card Power User is defined as a an individual that used their debit card more than an average GCEFCU member. ** Active means that within a 30 day time frame from the end date used to calculate the bonus, the checking account had a direct deposit and/or a Visa Debit transaction.